Giant Interactive’s $2.9 billion buyout is hard to resist. Chairman Shi Yuzhu is leading a consortium with Baring Private Equity Asia to take the U.S-listed Chinese computer gaming group private. At almost 13 times this year’s earnings, the group’s offer to buy the 53 percent that it doesn’t already own is a chunky premium to peers. Besides, independent investors have few alternatives. The offer of $11.75 per a share in cash is a modest 16 percent premium to Giant’s closing price on Nov. 22. However, it follows an 87 percent rise in the share price in the past year. U.S.-listed peers Perfect World, NetEase, Shanda and Changyou trade at an average of less than 9 times earnings for 2013. The offer is also 62 percent above the price at which an affiliate of Shi’s sold a block of shares equivalent to around 5 percent of the company in June. It’s not clear why billionaire Shi, who stepped down as chief executive in April, has turned from seller to buyer. Optimism over Giant’s product pipeline is one possible explanation. The company’s new online multi-player game, World of Xianxia, has proved popular in testing. In the medium term, Giant wants to turn its attention to faster-growing web-based games. Forgame Holdings, a top Chinese web games developer which listed in Hong Kong in October, now trades on a heady 40 times the last twelve months’ earnings. Removing Giant from the public market would allow Shi to play with borrowed money. Buying the shares it doesn’t already own will cost the consortium $1.6 billion. But that drops to around $1 billion after deducting Giant’s net cash, which was $509 million at the end of September. The company also generates plenty of cash: it paid out $88 million in dividend payments, on average, in the past two years. That would cover the interest payments on the consortium’s outlay, assuming an interest rate of 8 percent or less. Given the consortium’s appealing financial logic, Giant’s board may be tempted to fight for a better deal. But it’s hard to see other players entering the fray, and it will be harder for Giant to leverage itself up as a public company. Given the chairman’s large stake, it looks like game over for Giant’s independent investors. 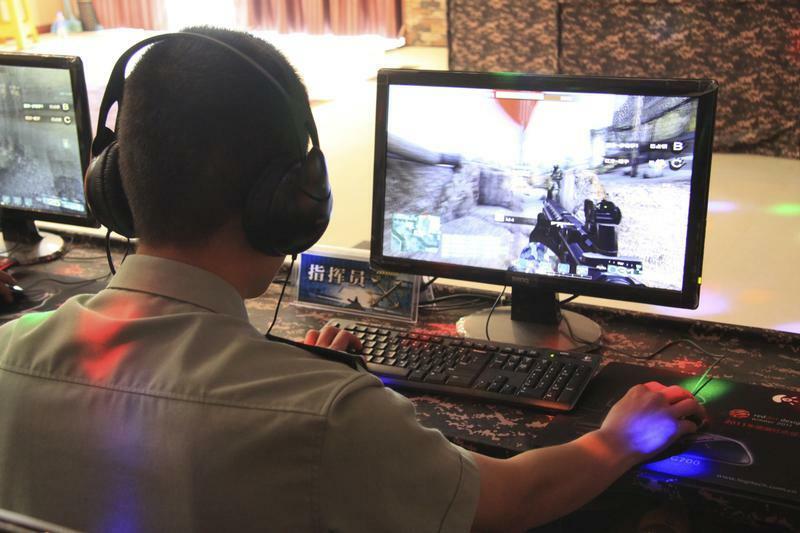 A People's Liberation Army (PLA) soldier plays "Glorious Mission Online", in this undated handout image provided by Giant Interactive Group Inc on August 2, 2013. Giant Interactive Group said on Nov. 25 it had received a non-binding takeover offer from a consortium led by its chairman, valuing the U.S.-listed Chinese online gaming developer and operator at $2.9 billion. Chairman Shi Yuzhu and an affiliate of Baring Private Equity Asia (BPE Asia) proposed an offer of $11.75 per share or American depositary share to buy the 52.8 percent of the company that they do not already own. The offer represents a 16 percent premium to the closing price on Nov. 22 of $10.13 per share. The consortium said it intends to finance the offer with a combination of debt and equity. BPE Asia would make any contribution through its Fund V which raised $2.5 billion in 2011, according to a person familiar with the fund. Giant announced a total annual dividend of 446 million yuan ($73 million) and 626 million yuan for 2012 and 2013 respectively. It had a net cash position of $509 million at the end of September. Giant’s games include the ZT Online series, Elsword, and World of Xianxia. Shi controls Shanghai Giant Lifetech Co. which owns 3.6 percent of China Minsheng Banking Corp and 1.3 percent of Hua Xia Bank Co, according to Eikon. Giant shares closed on Nov. 27 at $11.26.